Approximately 3/8". Post stud back. Rhodiumized Hematite Cubic Zirconia Post Round Stud Earring Set. 1/4" diameter. Drop Approximately 1.5". Post stud back earrings. Hematite Tone, Jet Glass & Black Diamond Rhinestone, Lever Back Earring Set. Drop length 1 1/8". Gold Tone, Light Green Acrylic & Glass Crystal, Light Blue Opal Rhinestone Fish Hook Tear Drop Dangle Earring Set. 3/4" X 2 3/4". Drop Approximately 2". Post stud back earrings. Drop length approximately 2.5". Fish hook ear wire. Drop Approximately 1.75". Post stud back earrings. Matte Gold Tone, Metal, Fish Hook, Angel Wing Dangle Earring Set. 5/8" X 2 3/4". Matte Silver & Matte Gold Tone, Black Glass Fish Hook Dangle Earring Set. Drop length 2". Matte Silver Tone, Metal, Fish Hook, Circle Dangle Earring Set. 1" X 2 1/2". Approximately 0.8". Post stud back earrings. Patina & Burnished Copper Tone Fish Hook Circle Dangle Earring Set. 1 1/4" X 2 1/4". Patina Fish Hook Leaf Dangle Earring Set. 1 3/8" X 2 1/2". Patina Fish Hook Sea Life Starfish Dangle Earring Set. 1" X 1 1/2". 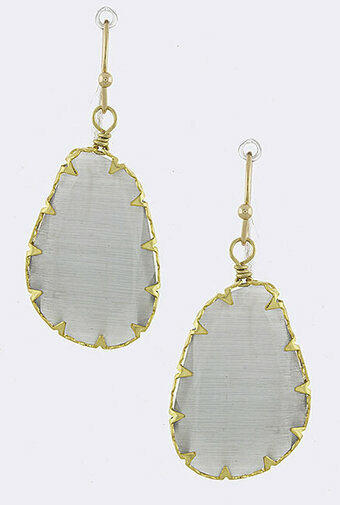 Pave Edged Filigree Teardrop Dangle Earrings - Mint. Drop approximately 2 1/2". Fish hook ear wire. Drop approximately 0.75". Post stud back earrings. Antique Silver Tone Fish Hook Fruit Pineapple Dangle Earring Set. 1 1/4". Pink Crystal Post Round Button Earring Set. 7/16" diameter. Swarovski crystal. Drop approximately 1.3". Post stud back earrings. Drop approximately 0.5". Post stud back earrings. Drop Approximately 1.3". Post stud back. Gold Tone, Red Semi Precious Stone & Glass Dangle Teardrop Earring Set. 1/2" X 2 3/4". Length approximately 0.75". Post stud back earrings. Rhodiumized, Blue Glitter Epoxy Fish Hook Starfish Dangle Earring Set. Drop length 1 1/4". Rhodiumized, Metal, Post Button Leaf Earring Set. Drop length 5/8". Rhodiumized, Clear Glass Crystal, Fish Hook Flower Dangle Earring Set. 3/4" X 1 1/2". 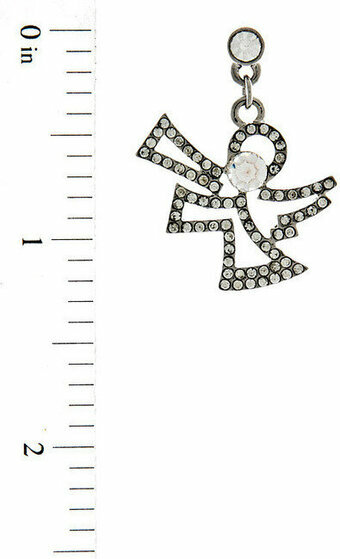 Rhodiumized, Clear Rhinestone Fish Hook Dangle Angel Wing Earring Set. 1" X 3 1/2". Rhodiumized, Clear Rhinestone, Fish Hook, Dangle Earring Set. 7/8" X 1 3/8". Rhodiumized Multi Color Abalone Shell With Epoxy, Fish Hook Dangle Rectangle Earring Set. Drop length 1 1/2". Burnished Rose Gold Tone Fish Hook Feather Dangle Earring Set. 2 1/2". Drop Approximately 3.25". Omega closure. Sapphire Crystal Post Round Button Earring Set. 7/16" diameter. Swarovski crystal. Burnished Silver & Gold Tone Fish Hook Heart Dangle Earring Set. 1" X 2". Antique Silver & Patina Metal Fish Hook Oval Dangle Earring Set.